What Long-Term Damage For Ramaphosa After Affair Scandal? Deputy President Cyril Ramaphosa (file photo). 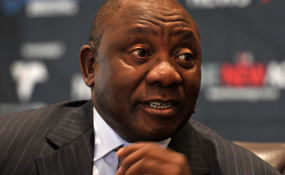 A WhatsApp message that has been doing the rounds, purporting to be correspondence directed to Deputy President Cyril Ramaphosa from a Sunday newspaper, has been rubbished by his spokesperson as a deliberate smear campaign. The message, which makes claims about Ramaphosa's personal life, includes a list of questions sent by the newspaper asking for clarity and confirmation on certain details. Ramaphosa's spokesperson, Tyrone Seale, said they were aware of the messages that made various claims about the deputy president's personal life. "There is no doubt that these messages have been circulated as part of a deliberate campaign to smear the person of the deputy president. "They are a transparent attempt to distort personal email correspondence that could only have been obtained through criminal means," he said. Seale said Ramaphosa would, in due course, release a detailed statement on the allegations contained in the messages. Attempts to get comment from Steven Motale, the alleged author of the correspondence, were unsuccessful at the time of publishing.